Invoices allow you to bill for products and/or services to your clients, but they are also a reflection of your business. 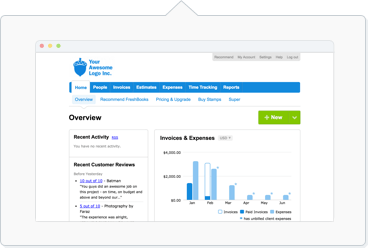 FreshBooks has some great Invoice customization options available to you, so you're able to create Invoices both you and your Clients love. The two main sections you can customize are Invoice Style and Currency & Language. Both the Invoice Style (templates) and Currency & Language are remembered by default on a per-Invoice basis. This means your most recently created Invoice will be remembered the next time you make an Invoice again. On the right of your Invoice you'll see Settings, click on Customize Invoice Style. Template - We have two default templates to choose from, Simple and Modern. This allows you to choose the layout of your Invoice. The Simple template looks more like the standard Invoices you're familiar with (albeit much more beautiful! ), while the Modern template includes a colored banner at the top of the Invoice and space for a large image or logo. For more information on how to upload a logo or what the size limits are, check this article here. Theme Color - This will change the color of the headings on the Invoice (such as Billed To, Date of Issue, Description etc), as well as the top banner on the Modern template. Font - We currently have Helvetica (Modern) and Garamond (Classic) available to choose from. Once you've customized your Invoice the way you want it to look, remember to click the green Done button to confirm the changes. This will save the Invoice style. On the right of your Invoice you'll see Settings, click on Currency & Language. Once you've changed your language and currency, remember to click the green Done button to confirm the changes. The Reference field allow you to record up to 25 characters like Purchase Order (PO) numbers, project codes, or work order numbers on the Invoice. How do I add, edit or change the Terms on an Invoice? You can edit an existing Invoice or create a brand new Invoice and use the Terms field at the bottom of the Invoice. This is a useful place to put your default payment information, bank transfer details, PayPal email and more. Terms are remembered by default on a per-Invoice basis. This means the Terms on your most recently created Invoice will be remembered the next time you make an Invoice again. Can I customize my Invoices further? Can I rename the headings? Currently you're only able to upload a logo/banner, choose your template, change the language and currency. If there are any further customization options that you're looking for, please reach out to us to submit a suggestion!